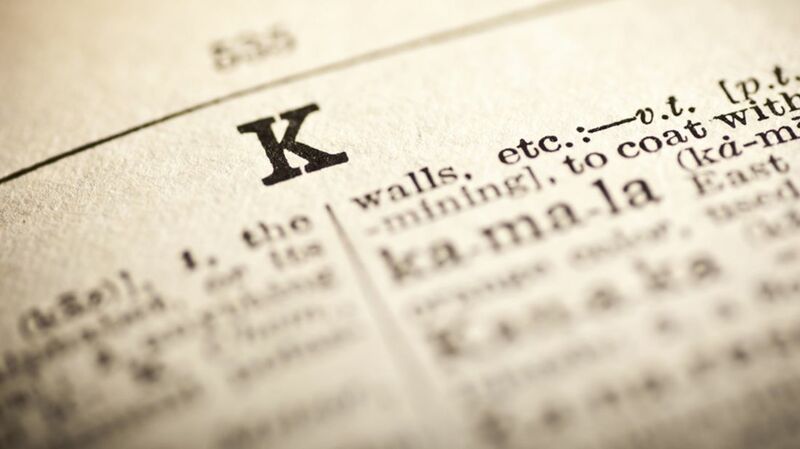 In English, K is the fifth least-used letter of the alphabet, with only J, X, Q and Z used less. That’s not the case in all languages, though. In German and Dutch, you’re twice as likely to use a K as you are a P. In Swedish, K comes in a respectable 15th place overall. However, in Italian, it is used even less than Z, and in French and Spanish it’s the least common letter of all. So why such different results? Well, our letter K has its roots in the identical Greek letter kappa, and when Ancient Greek words were first adopted into Latin, kappa was more often than not replaced by C, not K. This trend continued through to all the modern languages that are direct descendants of Latin—like the Romance languages French, Spanish and Italian—where K remains seldom used outside of loanwords like karate and ketchup. But in the Germanic languages (like German, Dutch, and Swedish), the use of K prevailed. So much so that today you can expect K to account for around 1.5 percent of any page of German text, but only 0.05 percent of a page written in French. English is a Germanic language, but thanks to the Norman Conquest, we have a lot of Latin and Romance influence too. This meant that, historically, K wasn’t completely eradicated in English, but it also wasn’t employed across the board. Instead a trend emerged in the early Middle Ages to use K either as a replacement for C whenever it was used with a “hard” sound (so Old English cyng became king), or else to reinforce it when it had a hard sound (so Old English sticca became stick). English is the only language that has undergone this change, and so our letter frequency statistics are nothing like any of our linguistic neighbors. All in all, you can expect K to account for roughly 1 percent of a page of English text, and for around 0.5 percent of the words in a dictionary to be listed under K—including the 40 knockout K-words here. Borrowed into English from German in the 19th century, a kaffeeklatsch is literally a “coffee-gossip”—the perfect word for chatting and catching up with friends over a cup of coffee. Someone who takes part is a kaffeeklatscher. The medical name for smelly sweat. If you’re terrified of failure, then you’re a kakorrhaphiaphobic. Other K fears include kopophobia (fatigue), koniophobia (dust), kathisophobia (sitting down), and katagelophobia (the fear of being laughed at). An old Yorkshire dialect word for a vegetable garden. …which is the delusion that things are more beautiful than they really are. “To slide in a crouching position,” according to the English Dialect Dictionary. An old Scots term of endearment for a young child. A noisy conversation with everyone talking at once. An 18th century word meaning “squeamish.” If you’re kecker-hearted then you’re cowardly, or easily nauseated. As well as being the name of a type of ship’s anchor, kedge is an old English dialect version of “catch,” which makes a kedge-belly an especially hungry or gluttonous person. Kenspeck or kenspeckle is an old Yorkshire dialect word meaning “conspicuous” or “easily discernable.” A kensmark is any feature or characteristic that makes someone or something instantly recognizable. An old slang word for a dancer (and in particular, a bad one), or else someone who foolishly capers about. A 16th century word for something grand or impressive that is in fact totally valueless or unsubstantial. Originally used only in reference to food, it’s an English corruption of the French word for “something,” quelque chose. Also spelled kicksy-wicksy or kickie-wickie, the word kicky-wicky was coined by Shakespeare in All’s Well That Ends Well as a pet name for a wife or girlfriend. He probably modeled it on kicksey-winsey, an earlier 16th century word for anything whimsical or fantastic. An old southwest English word for an unlicensed public house or tavern, or any unlicensed premises that sells alcohol. To cough repeatedly because you have a tickle in your throat. An 18th century word for random odds and ends. If you notice that something is moving, but your perception of how it’s moving is different from its actual movement, then you’re experiencing a kinephantom. Some optical illusions are examples of kinephantoms, but the most common example is one you’ll see on most car trips, when the wheels of a car driving alongside you appear to be moving backwards. Also called a king’s bad bargain, this term from 18th century slang describes someone who shirks their work or duty. It originally referred specifically to a soldier in the British Army, hence the reference to the king. When two people lock or cross their arms together to form a makeshift “seat” for a third person, that’s a king’s cushion. Also called kintraclatter, this is “the talk of the town,” or all the local gossip in a particular location. When rolls or loaves of bread expand during baking so that they end up touching each other and have to be torn apart before serving, the part where they touch is nicknamed the kissing-crust. A compulsive desire to shout. Someone who can’t seem to control the volume of their voice is a klazomaniac. Derived from kleptes, the Greek word for “thief” (as in kleptomania), a kleptoparasite is someone or something that steals food from someone else. A dishonest story or statement. Literally, it’s the kind of story a knavish person would tell. A shop that sells knickknacks? That’s a knickknackatory. A little knickknack? That’s a knickknacket. An old Scots word meaning “short and thick.” Or else another name for anything short and thickset in shape. To bite or gnaw something gently is to knub it. A 16th century word for a very clumsy person. The first part of the word is derived from knuckle-bone. Something that’s knurry or knurrish is full of knots and tangles. A koan is a logic puzzle or paradox purely geared towards stimulating the mind. It’s a term from Zen Buddhism, in which students are given problems and paradoxes to train and improve their thinking. It means “public matter” in Japanese. An old word from the far north of Scotland for a large stone worn down and made round by the sea. The use of clear, literal language instead of figurative language and metaphor is kyriolexy or kyriology.